Abstract: This article will cover purchasing and setting up home wireless equipment, look at the available standards for wireless networking, and cover some basic security guidelines. As everyone knows, Wireless networking is hot. Or at least the idea of it is... Wireless networks abound in coffee franchises, Colleges and even McDonalds (in theory). And why not? It's an inherently desirable idea. No wires, minimal setup, as we said, why not ? Well, price used to be the reason, but now driving this boom is the falling price of basic wireless networking equipment. The premium over conventional wired networks has dropped to a point where wireless is a valid option for most home networks, not just businesses and educational institutions. So let's look into what is involved in making your home network wireless. This article will cover purchasing and setting up home wireless equipment, look at the available standards for wireless networking, and cover some basic security guidelines. If you have already set up a conventional home network, jump right in. Otherwise you may wish to read the PCSTATS Guide to basic home networking to get a better idea of the basics of networking computers. This article assumes a few things: That you have two or more computers with Windows operating systems, a basic knowledge of computer terms, and an understanding of what networking computers together implies. This SMC wireless router is an example of what could be used. Some wireless routers only have one antenna, but we find two preferable. You can read PCSTATS' review of this equipment here. 2. One wireless network adaptor for each computer or device that you wish to connect to the router/access point. When it comes to purchasing for your wireless networking equipment, it pays to shop around. The majority of wireless equipment is produced by well-known companies, such as DLink, Cisco, SMC or others and available only as a retail box item with a retail warranty. Generally this would mean that the best place to purchase would be at a major electronics retailer, but since wireless networking has become so popular, even the smaller independent computer stores stock a variety of wireless networking gear. These smaller stores do not expect anything like the kind of profit margins that the large retailers do, so you'll probably find better prices from them. Given that most items will carry a manufacturers warranty and not a store warranty anyhow, you can save a significant amount of money. 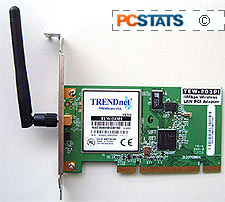 Two examples of wireless PCI network adaptors. 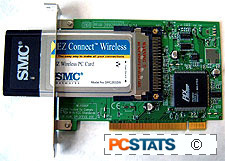 The SMC 802.11b adaptor to the left is simply a wireless PCMCIA card in a PCI adaptor. Whereas the TrendNet wireless adaptor to the right is more integrated and features a removable antenna. When it comes to signal strengths, the two types of wireless adaptors should be fairly even, but a larger antenna can be attached to the TrendNet model to give it an advantage. Easy enough, but if you need a few ideas of what to consider, PCSTATS' 802.11b Wireless LAN Networking Roundup is a little dated, but a good place to begin if you're unfamiliar what kind of features are available in wireless access points and routers... after all, speeds change but WiFi features have remained pretty similar. Now, let's get started.